Japan will act as a sincere friend of Sri Lanka during challenging times the latter may have to go through, Japanese Prime minister Shinz Abe said yesterday. 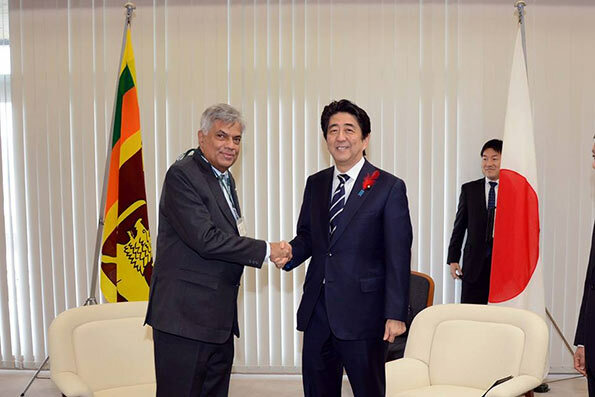 The Japanse Prime Minister made this point when he met his Sri Lankan counterpart Ranil Wickremesinghe prior to the 12th Science and Technology Summit in Kyoto last morning. Mr. Abe was confident that the bilateral ties between the two countries would further develop under the new Sri Lankan administration and that Sri Lanka would become a trade and economic hub in Asia in time to come. He recalled that the bilateral ties were originally developed after a speech made by late President J. R. Jayewardene made on Japan at San Francisco in 1952. He said the Japansese people will never forget this speech. Mr. Wickremesighe in his reply thanked his Japansese counterpart and said Japan will play a major role in building global relationship in the next decade. He appreciated the hand given by Japan in the fields of education and development of technology. He said government to government and private sector to private sector relationships should be developed between the two countries. Meanwhile, Mr. Wickremesinghe who addressed the science and technology summit said the current Sri Lankan government is committed to meet out justice to those who were distressed. Also he said Japan which had accepted that war is not a means of overcoming international crisis and become a global leader through the development of science and technology. “Asia needs such leaders,’ he said. Stating that innovation should be a basis of development, the Prime Minister said many countries in South Asia had not been able to reap the benefit of such innovation. Mr. Wickremesinghe therefore stressed the need for a joint science and technological initiative between Japan and South Asia. yes japan is a sincere freind considering that Sri Lanka allows all its junk to be imported at no cost to the Japanese. Further what do the Japs import from us and they talk talk talk of aid and more talk.